The twin beds are used when you want only for yourself or to save some room space. It is small in size and width compared to a full size bed. There are some contemporary twin beds reviewed in this article, which will make it easy to find the right one for you. Comfortable and sturdy Andover Mills Metal Bed features simple classic design with brushed bronze finish and supportive slats to protect your mattress from wear and tear. The curvy headboard and footboard style renders the metal frame a softer and elegant look which will complement your bedroom décor. Elegant brushed bronze metal frame. Extra support and stability with 7 legs. Headboard, footboard, rails and slats included. Simple and minimalist yet decent design of Eco-Lux Padded Upholstered Platform Bed gives a breathtaking charm to your trendy bedroom décor. This sturdy solid wood bed frame features a headboard upholstered in faux leather and 12 wooden slats to provide optimum support to the mattress. The faux leather upholstered look enhances the appearance of the bed while ensuring durability of the bed frame. This Padded Upholstered Platform Bed is a perfect choice for its elegant look and simple yet decent design to match your requirements and the bed blends perfectly with your beautiful bedroom interior. Appealing padded upholstered platform style bed. 12 slats included with the bed with 3” spacing between them. Slats can be removed and replaced by box spring. The simply elegant Wildon Home ® Montreal Sleigh Bed will transform your bedroom décor into warm and inviting space. This classic and regal sleigh-styled bed features solid wood construction to ensure durability and stability and an appealing and the wooden frame with captivating and rich brown finish will blend perfectly with your bedroom interior. This simple and chic in style bed also includes sideboards and four mattress supporting slats to render optimum support for the mattress. This bed is available in different sizes so that you can choose twin size, king size, queen size or full size according to your requirement. Montreal Sleigh Bed collection by Wildon Home ®. Constructed from Asian rubberwood solids and walnut veneer. Aesthetically appealing Atlantic Furniture Concord Storage Platform Bed comes with two substantial storage drawers where you can keep bed sheets, pillow cases or even stack toys of your kids or other items or objects. The free-floating drawers are on rolling wheels and swiftly glide in and out of the drawer frame. This beautiful and functional bed features a durable and sturdy solid wood constructed bed frame with rich wood finish and slats to provide support to the mattress from wear. The bed is available in various finishes (Antique Walnut, Caramel Latte and Natural Maple) and different sizes (twin size, queen size, king size and full size) with adjustable height to better suit your requirements and bedroom interior. Concord Storage Platform Bed collection. Made from 100% solid hardwood. Bed has one open foot rail. Sturdy wooden dowels, barrel nuts and bolts. Height of the bed is adjustable in two settings. Slats included for mattress support. Two generous drawers for storage of bed sheets and pillow cases. Drawers can be used from either side of the bed. 100% non toxic and lead free, eco- friendly. Complement your bedroom interior with this amazingly elegant and minimalistic simple Newport Simple Platform Bed. 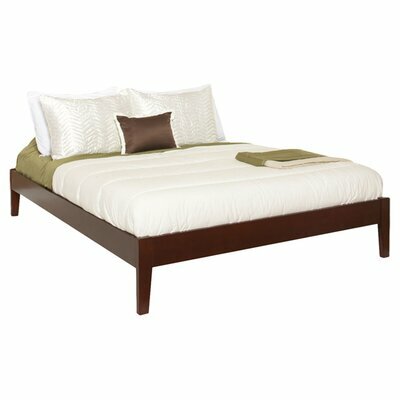 This bed features a tropical mahogany wooden frame which is sturdy and long lasting and 14 slats with center support legs for additional stability. The platform style bed is easy to assemble and is available in two finishes i.e. Cordovan and Espresso and; various sizes (twin size, queen size, king size, California king size and full size) to beautifully blend with any bedroom décor and space. Newport Simple Platform Bed collection. Made from Tropical Mahogany wood. The bed is available in Cordovan and Espresso finish. 14 solid wood slats (2.5″ wide) which can be used with or without a box spring. Two center legs for extra support. Width of side rails is 5″. Side rails are 8 inches above the floor. Hokku Designs Villa Platform Bed radiates aura of trend and luxury to compliment your bedroom interior. This platform bed features a wooden frame constructed from solid wood, wood veneers and leatherette; beautiful tapered legs, upholstered headboard and low footboard with faux-leather gives it a comfortable and luxurious aura. 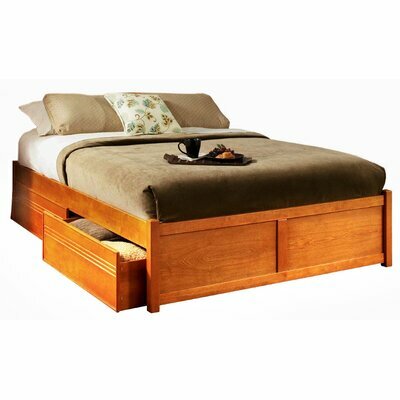 The lock hook joinery and has center support legs provides additional support and stability to the bed. The bed requires assembly and is available in several sizes. Villa Upholstered Platform Bed collection. Constructed from solid wood, wood veneers and leatherette. Sturdy frame and panel provides structural integrity. 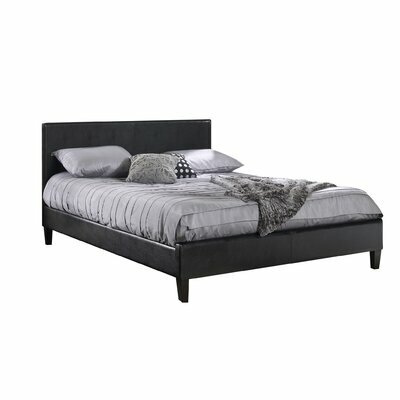 Trendy look with slightly curved headboard, tapered legs, and low footboard. Detailed stitching profile with exposed chunky wooden legs. Headboard, footboard and slats included. MDF slats and central support legs ensure extra stability and durability. 30 days product warranty against defects. 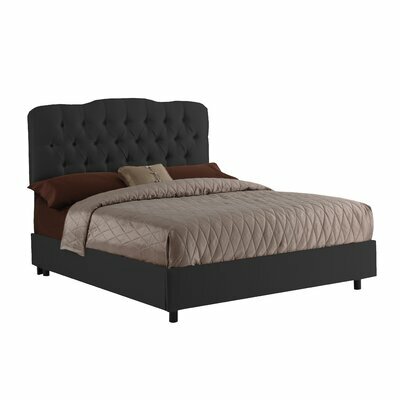 Other Bottom of Side Rail to Floor: 5.5"
Luxurious and elegant Skyline Furniture Panel Bed enhances the interior décor of your bedroom with its stunning trendy style tufted headboard. The comfortable headboard cushions your back while you read a book or enjoy bed tea. The headboard can also be easily adjusted up or down according to your desired height. Constructed from pinewood, this panel bed is sturdy and durable. The bed is CARB compliant (ensures indoor air sanitation) and ISTA 3A certified. This stylish bed is easy to assemble and is available in different sizes. Panel Bed collection by Skyline Furniture. Available in colors: black, Aztec, chocolate, khaki, lilac, parchment and wood rose. Meticulously tufted stunning Shantung fabric covers polyurethane foam. The comfortable headboard cushions your back while you read a book. Height of headboard is adjustable. Can also be used with pillow top mattress. Parchment fabric made from 60% cotton and 40% polyester ensures comfort and offer soft padding to your body. Upholstered rails are made of wood. Very easy to assemble with Allen wrench or any regular wrench. General Conformity and CARB compliant certified to provide healthy environment to your family. Other Bottom of Side Rails to Floor: 4"
Traditional meets trend in this stunningly gorgeous DHP Florence Upholstered Bed which lends a modern and romantic feel to your bedroom. This classy DHP Florence Upholstered Bed features a lavishly tufted tall headboard with matching lower footboard, both draped in rich faux-leather which gives elegant and sophisticated touch to your bedroom décor. The bed includes a slats support system for stability and can be used without a box spring. Sturdy wood frame construction to ensure durability. Available in white, black and savage brown color. No need of box spring or bunkie board. Enhance the beauty of your bedroom décor with this chic and appealing Hodedah Metal Bed which is made from sturdiest metal to ensure durability. This is an artistic and classy designed bed with round finials on the headboard and footboard, ornate carvings with swirled accents. The Hodedah Metal Bed is sturdy yet stylish and features perfect height for you and your kids to hop in and out of bed with convenience. The bed frame includes slatted supports and hence box springs are not required. Gorgeous rushed bronze metal frame with bronze finish. 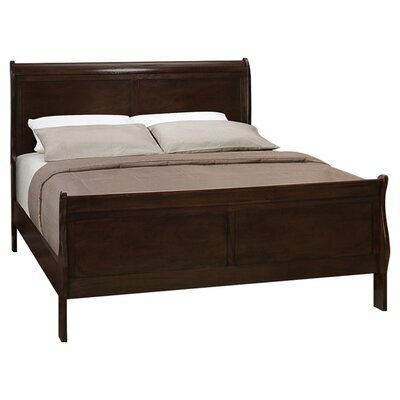 Bed includes the headboard, footboard slats and bed rails. 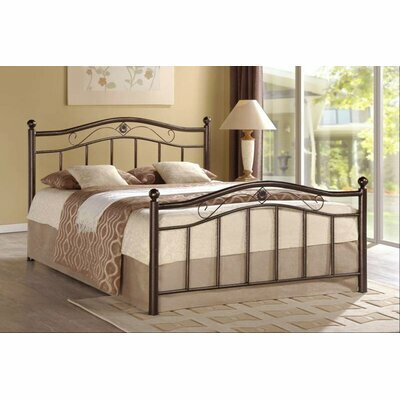 Other Bottom of Side Rails to Floor: 8"
Sophisticated yet trendy look of this FBG Aynsley Metal Bed will radiate an aura of luxury and comfort your bedroom. This gorgeous metal bed features artistically crafted molded metal scroll designed headboard and a footboard with Majestique finish. The stunning light bronze color with some gold and silver undertones will provide warmth and enchanting charm to your bedroom décor. The bed includes center support legs and rails for additional strength and stability of the metal frame. FBG Aynsley Metal Bed collection. Stunning metal bed frame design. Mesmerizing Majestic finish: a lighter bronze color with some gold and silver tones. Beautifully designed headboard and footboard included. Center support legs and rails provide additional stability. Box spring not included (required). Maximum weight capacity of bed is approximately 300 lbs.